Today I wanted to take the time to point out two important tools for placement and stats on search engines. I am talking about Google Analytics and Google Webmaster Tools. Some of you may know what I am talking about and others may not. Hopefully this article can help give you a better understanding on what they do. 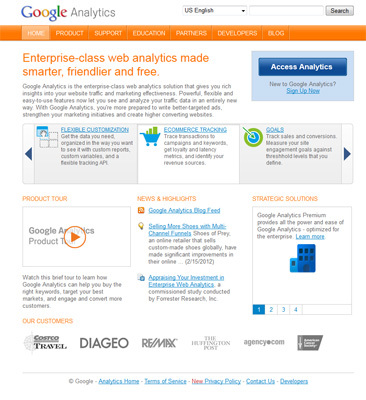 Google Analytics, is a tool Google uses to help track traffic to web sites. Not only does it help Google, but it can help you as well. GA gives you rich insights to your web traffic. To set up a analytics account, you will need a Google account. After that you would go to the analytics page, and fill out the information about your website. Once this is done, Google will give you a tracking code to add to the head of your web page, place the code on any page you want to track, most likely this will be all of your pages. Once done, it takes time for Google to start compiling stats for you, I always tell new clients to give it at least a week. Why is this important? Well, GA breaks down your traffic in every way possible, want to know how many hits your getting from India? No problem, how about what key words people are using to find your site? No problem, or would you like to know what other sites are linking to your site? Google Analytics lets you know all of this in extensive reports. As you can see, GA helps you really fine tune your web site by showing you how the rest of the internet sees your site. Now the other important tool is Google Webmaster Tools. Once you have your site up, you should immediately enter your site in Google Webmaster Tools. Here it fine tunes more search engine placement and will link directly into your analytics account. Google Webmaster tools, also lets you submit site maps, which are very important in getting your site crawled by search engines. Google crawls sites by itself, but that may take months and they miss some pages that should be indexed, but with a site map, it helps Google and other search engines find and index all your pages. Google Analytics and Google Webmaster Tools are great tools to help you find your place on the Web, next time I will cover Bing Webmaster Tools and how that tool also helps you.